Foiled Again | 2P START! I’m also not sure why Wart has a pipe organ/machine that shoots out vegetables when he’s allergic to them. But all villains need their weak point so the hero can inflict substantial…nay, MASSIVE damage. Anyhow, hope you enjoy the comic. Last week’s comic was the third in a row to win Joystiq’s Weekly Webcomic Wrapup, so I just wanted to say that we still really appreciate the support we’ve gotten. It’s a lot of work to do a webcomic (especially for Ray), even once a week. So it’s great when we get all this positive feedback because it makes us excited to be doing this. I’ve got a full-time job, an MBA program I’m in, and a wife to take care of. Ray has PLENTY on his plate too as he’s graduating from college this Saturday (yay Ray!). The point is, we don’t do this out of boredom because there’s plenty of other things to do with our time. We’ve really been enjoying this and hope we can keep it up for a long time. Thanks again! Oh, and my favorite tagline from last week’s comic was a comment from Loki: “With great power comes great power consumption.” You can tell I love parallel phrasing from this week’s comic. There were a lot of taglines that made us laugh, so thanks for all the comments! Totally an axe, by the way. Yeah, I think you’re right. The votes are definitely going that way, but I swear I always thought it was a key. I never doubted it until a couple of hours ago. The comic actually had ‘key’ in it, but then I got to thinking, “Is that really a key?” So we put axe/key in there because even my Google search was a bit inconclusive. That’s 8-bit graphics for you! That was great. Never questioned all that till now. So, you guys do comics every week? Ganondorf at the end of Twilight Princess: Where’d I put that Triforce? Well, I read quite a lot of webcomics, and I must say that you’re doing a great job. This comic definitely has a lot of potential, the jokes are top-notch and the art is very detailed. You guys deserve all those awards :). I don’t have any problem with the comic published only once a week, as long as you are on time with every issue. It’s understandable, that such quality pictures must take some time to draw, and I’ll take quality over quantity anytime. 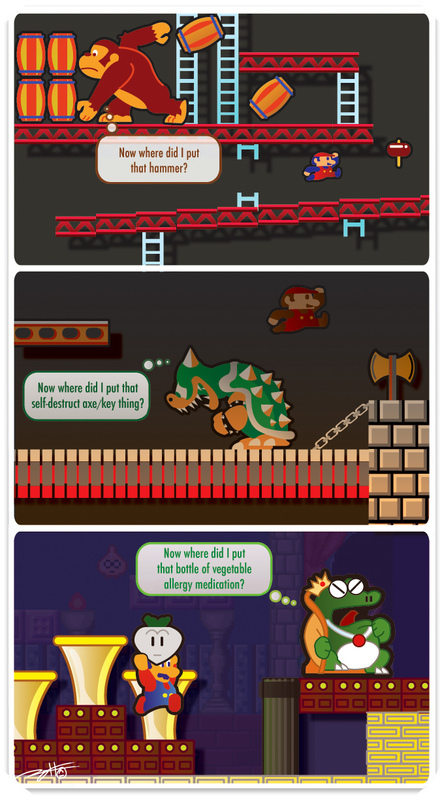 Wouldn’t it be nice to see a cameo game for Bowser? Mario: Now where did I put that mega-mushroom? As much as we love you Mario, we all want to know what would happen if you got squished. Good stuff! I always wondered that myself, why would you stand on that shoddy bridge over lava if you’re fighting your mortal enemy? Does he think he can push him in? Just in case, lets put an axe on the other side of the bridge, so that this guy (who can jump pretty darn high) can jump over me and cut the wires on this bridge. I love you Bowswer, but c’mon man! I have been a passive observer of your webcomic since seeing the first comic that you guys made. Judging from the comments that you guys are recieving and the awards that your comic is garnering, the progress of your webcomic is at an exhilirating rate! As many have already said, this webcomic deserves the recognition because of its original quirks and easy-on-the-eye visuals. Keep up the good work, guys. Even if it takes some time to upload a comic, don’t sacrifice the beauty and splendor for a mere placeholder. Most of us understand the longevity of updating, so there is no problem of worrying if we (your fans) are appeased. Godspeed, guys. You have deeply impressed me. It’s an axe. And with the axe, Mario cuts the chains of the bridge Bowser is staying on. Didn’t you see that when Mario gets the Axe, the bridge dissapears ? I’m liking the comic so far guys. Keep up the good work. BTW I love your comics, They are good and they are helping people love my site even more. Awesome comic! And congratulations on your graduation! It’s good to know that your schooling will be put to good use through this comic, Ray. Dude it’s a freaking lever! I looked on some FAQs and they called it an AXE LEVER…. I thought it was a switch or level! I used to have a little comic… *pauses and looks wistfully into space* Maybe I should scan it, and show you guys… they didn’t make any sense, but you could sometimes find the humor. Ya men!! lets see it! I dont know how its done or if you gotta ask Tim and Ray for permission, but it would be cool. Remember: If you’re a bad guy, or an end of level boss, perhaps it isn’t the best thing in the world to keep the only weapon that can kill you in the same room as yourself. Destroy it, that might be an idea. You just traced over the fricking sprites! go play New Super Mario Bros. Anyway, great comic! Keep up the great work. It’s an axe. Why would he have an axe-shaped key?